After a visit to the zoo or watching a television show about giraffes, children and adults can recreate the unusual animals in a craft project using clay. Polymer clays are well adapted to making a permanent giraffe with kids. Air-dry modeling clays are are also suitable for making the long-necked and distinctively patterned animals. After the project is completed, the giraffes can be used as toys or set on shelves or window sills as decorations. Select packages of bright yellow, orange, brown, black and white clay for the giraffe project. Remove the clay from the package and knead it with your hands to soften it. Place a sheet of glass, newspaper or wax paper over your work area. Keep lint, animal hair and dust out of your work area as you craft the giraffe. Roll a ball of pure yellow clay with your hands for the giraffe's body. Squeeze it with your fingers into a cone shape or roll it on the table, applying more pressure to one end to shape it. Make another cone for the head. Roll out four equal sized tubes for legs. Taper the legs by rolling one end between your thumb and fingers. Roll several tiny balls of brown or orange clay. Flatten the balls and press them firmly onto the body parts for the giraffe's coat pattern. Roll balls of yellow clay and flatten them into teardrop shapes for the ears. Form two small brown tubes for the horns. Make two white clay balls for the eyes. Press black spheres into the center of the eyes. Press all the face parts onto the head. Use a toothpick to incise a mouth and nostrils. Cut a 1-inch section of 22-gauge copper wire with scissors. Stick the wire in the top of the giraffe torso. Press the head onto the wire and the torso. Score the top of the legs with the toothpick and press them onto the body. Flatten the bottom of the legs for feet. Make grooves in the centers of the feet for hooves. Roll out a skinny tube for the tail and stick a ball of brown clay on the end. Use the toothpick to scratch hair texture in the tail end and on the top of the head. Attach the tail to the body. Preheat the oven to 275 degrees Fahrenheit. Line a cookie sheet with aluminum foil and bake the giraffe for 15 to 25 minutes. Prop the giraffe up with a small heat resistant object so it doesn't fall over. 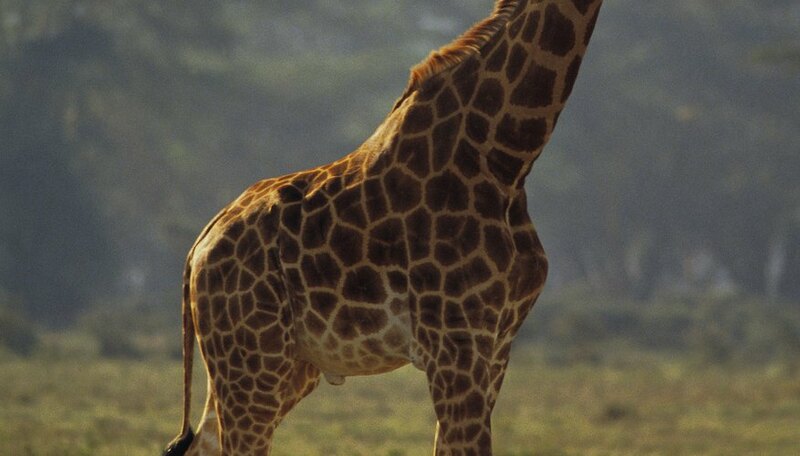 Use craft super glue gel to repair a broken giraffe after baking. Do not use a microwave oven to bake the giraffe. Do not bake the clay at temperatures over 275 degrees Fahrenheit.